Join participating Iowa E15 retailers, National Breast Cancer Foundation (NBCF), and The Hormel Institute for October’s Pink at the Pump® campaign to fight breast cancer with cleaner-burning E15. Participating Iowa E15 retailers will donate 3-cents of every gallon of E15 sold during the entire month of October to NBCF and The Hormel Institute to help fight breast cancer through early detection, education, support services, and research. E15 is approved for use in all 2001 and newer vehicles, and contains less toxins and cancer-causing chemicals than straight petroleum gasoline. 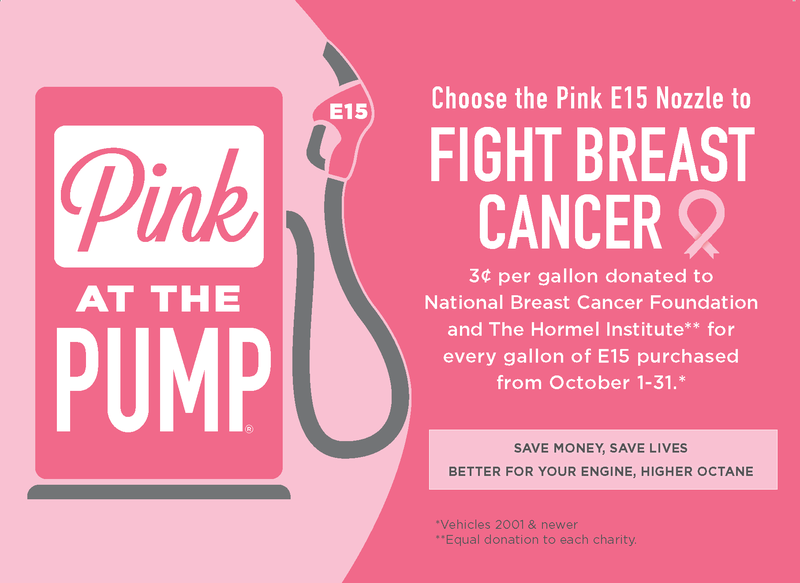 By choosing E15 at participating Pink at the Pump® locations during the month of October, you’re not only supporting a healthier fuel choice, you’re helping to combat breast cancer! To learn more about E15, please click here.